Recent terrorist attacks on Belgian soil raised concerns that Belgium’s longstanding protections for civil liberties could be weakened, as Belgium’s leaders approved greater powers to detain suspects and track communications in March 2016. Generally however people in Belgium are free to form associations to advance collective interests, to gather peacefully in public places and to share ideas, opinions and information freely. 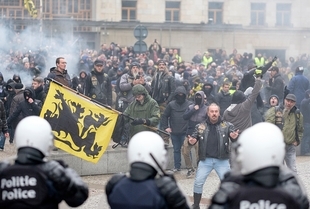 A string of protests with reports of violence and hundreds of arrests took place in Belgium during the months of November and December 2018. Belgian police confirmed to have arrested about 60 protesters during French-inspired “yellow vest” protest in Brussels on 30th November 2018. They were reportedly arrested before the protest became violent, mostly for public order offences. The protest mobilised against high fuel prices and a squeeze on living standards and some protesters were calling for the resignation of the Prime Minister chanting “Michel, resign!” It started as a peaceful demonstration that mobilised mostly through social media about 500 people, according to reported police estimates. However, once the protesters converged at the office of the Prime Minister Charles Michel some started to throw rocks, firecrackers and road signs towards police and clashes with police were reported. Protesters destroyed at least two police vans during the disturbances. The riot police responded with water cannons and fired gas rounds, as further arrests were made, dispersing the protesters. French 'yellow vests' inspired protests that reportedly turned into riots with some protesters resorting to violence took place earlier in November in the southern parts of Belgium, such as in Feluy and Charleroi. Dozens of protesters were reportedly arrested by police. In a consecutive “yellow vest” protest in Brussels, held on 8th December 2018 the Ligue des Droits Humains (LDH - League of Human Rights, in English) raised concern over media reports that nearly half of the estimated 1,000 people who went to protest were arrested and “deprived of their freedom”. The Brussels public prosecutor's office reportedly confirmed that 450 people were arrested ‘administratively’ in addition to 10 ‘judicial" arrests in connection to the 'yellow vests' campaign. According to media reports, the arrests were made after some of the “yellow vest” protesters threw rocks and firecrackers and damaged shops and cars as they tried to reach official buildings in Brussels. As in the previous protest of 30th November, police riot squads used water cannon and tear gas to disperse the protesters and keep them away from the European Union headquarters and the nearby government quarter. On 16th December 2018, another protest called ‘March against Marrakesh’ took place in Brussels, this time mobilised to denounce the Belgium government support of the United Nations Global Migration pact. The anti-migration rally in Brussels was organised by several far-right groups. Protesters that gathered outside the EU institutions clashed with police and according to reporters on the ground, fired projectiles and firecrackers. Police detained around 90 people of the estimated 5,500 protesters and fired tear gas and water cannon to disperse them. A counter-protest attracted around 1,000 participants organised by over 40 progressive organisations such as trade unions, associations, students, feminists, citizens and human rights activists. The organisations raised concerns that “this march of the extreme right and fascists” would spread "their dangerous and toxic ideology in society and encourage actions against minorities.” The organisations said that with the protest they aim to “mobilise and to support a social alternative" based on human rights and democratic freedoms. Both protests were initially banned by Belgian authorities over fears of unrest, but the country’s supreme administrative court overturned the ban citing the right to protest peacefully. The UN Migration Pact, called The Global Compact for Safe, Orderly and Regular Migration, was backed by 164 countries and adopted at a United Nations conference in Marrakesh on 10th December 2018, despite opposition of some states. The Global compact is non-legally binding, it is grounded on values of state sovereignty, responsibility-sharing, non-discrimination, and human rights. However, it has been a subject to growing controversy and heated political tension as several states have withdrew their support, in the context of strengthened security measures and restrictive migration policies and rising influence of far-right movements with predominant anti-migrant rhetoric. In Belgium, the support of the UN migration pact led to government crisis after the biggest party in the coalition, the Flemish nationalist N-VA, quit. The Government collapsed after the opposition Socialist party, with support from the Greens, proposed a vote of no confidence. Journalists covering the anti-government protests in Belgium reportedly suffered harassment and arbitrary arrest. On 20th November 2018, correspondent Vinciane Votron of the Belgian public TV channel RTBF reported live that the protesters were aggressive toward her and her crew during the protests in the town of Feluy. A journalist working for the local Derniere Heure daily newspaper was arbitrary arrested while covering the protest during the night of 24th to 25th November in Charleroi. Patrick Lefèbvre claimed that he wore an orange jacket with the label "Presse" and had his ID card exposed around his neck, but police accused him of being a fake "journalist." He was reportedly held in a police station over the night and finally released without an explanation. On 30th November, a French video journalist Remy Buisine working for the French news website Brut was arrested and briefly detained by the police while recording a live video of the Brussels protest. The arrest was reportedly made despite the journalist presented his official press card. The Belgian Association of Professional Journalists (AJP) condemned the arrest and called on the Prime Minister and Interior Minister to provide an explanation. Associations of every type are abundant in Belgium, and are allowed to operate freely, unless a group openly and repeatedly practices discrimination. Article 27 of the constitution states that the right to associate cannot be subjected to any preventative measure. The Belgian constitution provides for freedom of association. In practice, civil society has flourished, though some experts believe that NGOs are too dependent on government funding, undermining the sector's ability to function as a watchdog. In addition, there are reportedly troublesome limitations put on certain freedoms as a result of the growing fear of terror attacks. However, only a few reports have been published on such limitations. The right to join and form unions and to bargain collectively is protected by law. Protests happen frequently and recent ones have addressed a range of grievances, including unfair prices for agricultural produce, government austerity policies and protracted political in-fighting. Belgium also attracts protestors from across Europe, who come to demonstrate against policies of the European Commission, which is housed in the capital Brussels. Article 26 of the Belgian constitution states that “Belgians have the right to gather peaceably and without arms, in accordance with the laws that regulate the exercise of this right, without submitting it to prior authorization”. However, local authorities and police in Belgium place significant restrictions on the full exercise of this right. Time and space restrictions on lawful gatherings are reportedly common, and participants in spontaneous protests can be arrested. Trade unions facilitated a number of mass demonstrations in the last few years against the government's austerity measures. The last one, in May 2016, attracted an estimated 60,000 demonstrators protesting the proposed extension to the maximum hours in a workweek, as well as increasing the retirement age and the temporary suspension of automatic wage increases. After a group of demonstrators turned violent, the police doused the protesters with water cannons. Protests against EU policies or measures regularly take place in Brussels. For example, in September 2016 approximately 10,000 protesters took to the streets to call on Europe to pull out of CETA-TTIP negotiations. Most of these protests have been peaceful and well-policed. Belgium enjoys a healthy respect for free expression and is home to a pluralistic and generally free media environment, even if ownership of main newspapers is concentrated in a handful of companies. There have been isolated cases where photojournalists have been assaulted by police and there has also been at least one incident in recent years indicating that Belgian courts may narrowly interpret freedom of expression. Belgium enjoys a healthy respect for free expression and is home to a pluralistic and generally free media environment, even if ownership of main newspapers is concentrated in a handful of companies. There have been isolated cases where photojournalists have been assaulted by police and there has also been at least one incident in recent years indicating that Belgian courts may narrowly interpret freedom of expression. Criminal defamation also remains on the statute books, and a conviction for slander can result in a custodial sentence of up to one year. The state does not interfere with Internet access in Belgium and 85% of people were online in 2014.